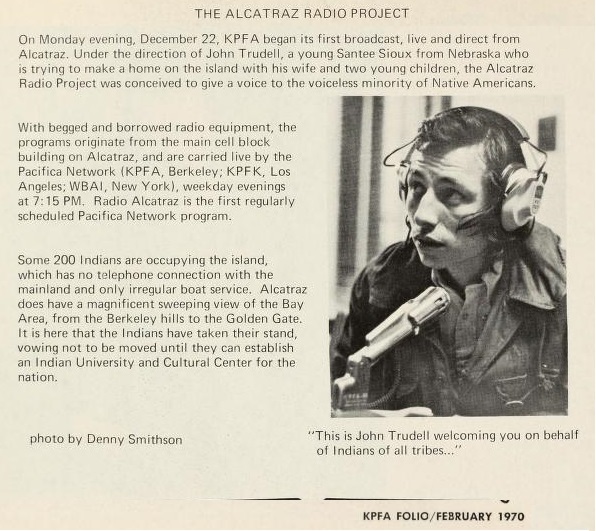 This Sunday, at 5 pm we will be tuning into Radio Free Alcatraz, cira 1970 with John Trudell. Would like to express my deepest thanks to Pacifica Radio Archives for providing both December 15, 197o and December 19th, 1970 segments for our listening. So tune in this Sunday at 5pm and listening to Free Radio Alcatraz with John Trudell. This entry was posted in Make No Bones Shows and tagged John Trudell, KAOS Radio, Pacifica Radio Archives, Radio Free Alcatraz. Bookmark the permalink.